Update 2018: After Hurricane Harvey in August 2017, Russ Poppe, the new director of the Harris County Flood Control District, announced at a bayou symposium in Houston that the district would not be pursuing the Memorial Park Demonstration Project. What is the Memorial Park Demonstration Project? The project is a $12 million proposal (current estimate from the Harris County Flood Control District) to dredge, channelize, and reroute more than 1.25 miles of one of the last natural stretches of Buffalo Bayou in in the middle of Houston. The initial cost of the project was estimated at $6 million. Most of the north bank of the project is forested public land: Memorial Park and the Hogg Bird Sanctuary west or upstream from the Shepherd Bridge. There are also some private residences between the park and the sanctuary, although the banks are owned by the Harris County Flood Control District. 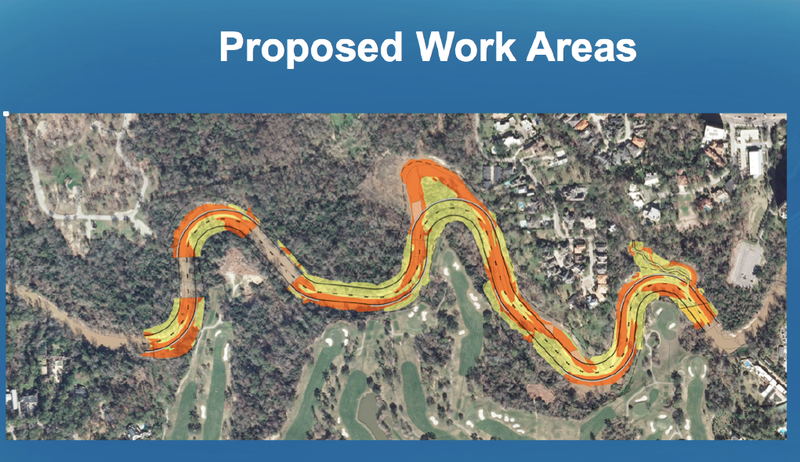 The entire south bank of the project, most of it forested also, is owned by the River Oaks Country Club, which in 2014-15 was in the process of rebuilding and upgrading its golf course. That renovation has been completed. City and county taxpayers are paying a minimum of $4 million for the project (expected to double at least). The country club, which owns half the property in the project, was to pay $2 million and likely will be asked to pay more. The price does not include future costs of monitoring, maintenance, and repair of the weakened and vulnerable stretch of the bayou after reconstruction. But their analysis of what is happening in this stretch of the bayou is wrong. The whole project is based on a mistake. We think it will cause greater flooding and erosion, especially downstream, (see also here) and will likely fail. The flood control district also says that this historic nature area is suffering from severe erosion. In fact, as mentioned above, they have misdiagnosed the bayou, which happens when you come up with the remedy before you figure out the problem. In any case, this statement about “severe erosion” is contradicted by the scientific studies included in the district’s application to the Corps. Erosion in this stretch is relatively minimal due to the existence of healthy riparian buffer, i.e. trees, plants, and soil specially adapted to waterways and necessary for cleansing the water, holding the banks in place, slowing storm water, and providing wildlife habitat. But rivers erode. They take some away and give some back. It’s what healthy rivers do. But some of the high banks of the country club look terrible! The condition of the south bank owned by the country club is the result of land management practices inappropriate for river banks. In fact, this entire Flood Control project violates Best Management Practices for river banks and riparian areas, demonstrating to landowners exactly the wrong thing to do for erosion control. Cutting down trees and removing vegetation, digging up the banks and compacting the soil with heavy equipment are all violations of federal and state policy and regulations for protecting the riparian areas so vital for the health of our waters, our streams and rivers, feeding into our bays and oceans. Why is Save Buffalo Bayou opposed to this project? This project is destructive, entirely unnecessary, and a waste of public funds. Rather than “improve aquatic functions,” it will destroy the bayou’s ecosystem as well as a historic nature area filled with geologic treasures, including very old high bluffs and sandstone. The project will result in greater erosion, worsened water quality, and more expensive problems. Houstonians need nature. We are fortunate to have this remaining semi-wild stretch of our 18,000-year-old southern bayou running through the middle of our city. Buffalo Bayou is a river, and a river is a dynamic, living process. It adapts, rebuilds, replants, and restores itself better than any engineering project. The most enlightened river management practice today is to work with rather than against nature. We are fortunate in Houston that in this large public park area, we have room to let Buffalo Bayou be a river. We can learn about nature by observing and respecting this beautiful bayou flowing past our great pubic park. And natural, green systems provide better defenses for flooding. Who is promoting this project? The Bayou Preservation Association, the Memorial Park Conservancy, the Buffalo Bayou Partnership, the City of Houston, Harris County, and the Harris County Flood Control District are promoting this project. On April 19, 2017, after a delay of nearly two years, the Army Corps of Engineers approved a permit for the project under the federal Clean Water Act. The Texas Commission on Environmental Quality (TCEQ) approved the permit on March 31, 2017. After initially refusing to release the Environmental Assessment of the plan required under the National Environmental Policy Act, the Corps finally released the assessment on May 16. You can read it here. Please do, and send us your comments. 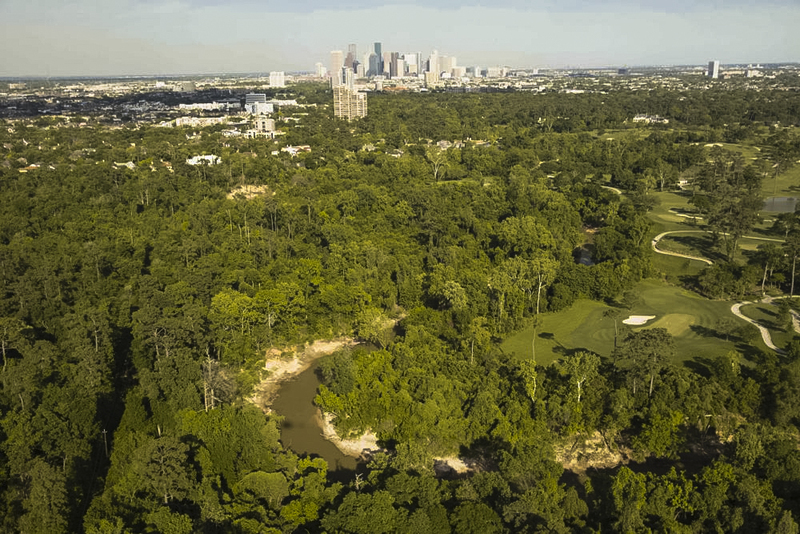 The Houston City Council and Harris County Commissioners Court, as well as the members of the River Oaks Country Club, will have to approve additional funding for the project. The flood control district will have a better idea of the final costs once it begins seeking bids from the “contracting community,” according to Jason Krahn, project manager with Flood Control. At the beginning of May 2015, the Army Corps of Engineers issued a revised public notice soliciting new public comments on a revised permit application allegedly reflecting the hundreds of critical comments and questions (including from public agencies such as the Environmental Protection Agency, the US Fish and Wildlife Service, and the Texas Commission on Environmental Quality) received by the Corps during the first public comment period last spring. In fact, the “new” plan from the Harris County Flood Control District was little changed. The second public comment period ended June 5, and again the comments sent to the Corps were overwhelmingly critical of the unscientific and destructive nature of the project, and most of them demanded a public hearing and environmental impact statement. However, the Corps has ignored those expert comments and demands and has now approved a plan that remains essentially unchanged since Flood Control first introduced it to an appalled public in December 2013. In the meantime the River Oaks Country Club decided to wait no longer and in late July 2015 armored two sections of its bank with concrete riprap. There were less environmentally damaging methods of repairing the country club’s banks. This website is loaded with information. Try looking under Plans and Maps. It is essential to call or write Harris County Precinct 4 Commissioner Jack Cagle, whose precinct includes this section of the bayou, as well as your own commissioner, and tell them to vote against any additional funds for this pointless, destructive project. Call or contact the mayor and your city council representatives also. Contact the board of the Memorial Park Conservancy, the Bayou Preservation Association, and the Houston Parks Board! Look under What to Do Now for contact information. Also Donate! Looks like we may have to fight this thing in court. Would a letter to Sen John Cornyn help? Sure. Send a copy to Mayor Sylvester Turner, your city council representative including at-large representatives, to your county commissioner, and specifically to Precinct 4 County Commissioner Jack Cagle, who is in charge of this area.